Latest design of the Happy Saints Alphabet Cards prototype, showing front and back. Would you rather purchase PDF version or hardcopy version of this card set? These look great! I would love a hardcopy set, but it would depend partly on size. 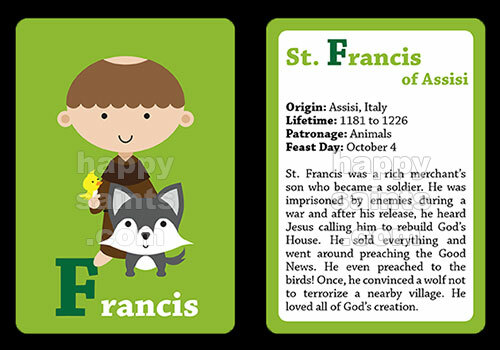 I am looking for saint cards to use with our homeschool calendar - to slide in behind each feast day to be read that day. My pocket chart (and most I think) have 3x3 pockets. So as long as the width is close to or under 3 inches they will fit. I think it would be neat if the top of the card - where the name is - shows over the date. So depending on size, the name would need to be in the top half inch or inch. That isn't a deal breaker though - the cards look great! I had been debating making my own with these: http://www.artscow.com/photo-gifts/playing-cards/multi-purpose-cards-rectangle-394 until I saw your post. But yours are so great looking I would definitely go with them if they fit! love it either the hard copy or the pdf file. It will be a great gift for godchildren this christmas.